I-Kiribati or kaini Kiribati. 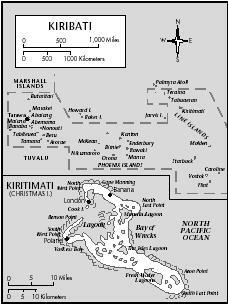 "Kiribati" is a transliteration of "Gilberts," the British colonial name for part of the Gilbert and Ellice Islands Colony. The Kiribati name for the Gilbert Islands is Tungaru, and the archipelago's inhabitants sometimes refer to themselves as I-Tungaru. Island of origin is an important aspect of identification that predates colonialism, and I-Kiribati differentiate themselves by birthplace. Identification. Kiribati is located at the interface of the Micronesian and Polynesian cultural areas and is generally considered Micronesian. The over-whelming majority of the population is I-Kiribati, with very small minorities (less than 2 percent) of Tuvaluans and I-Matang (Westerners). Location and Geography. The country consists of 33 islands in three primary groups—the western Tungaru chain (sixteen islands), the Phoenix Islands (eight islands), and the Line Islands (eight of the ten islands in the chain)—plus Banaba (Ocean Island) at the western edge of the nation. Ocean-rich and land-poor, these equatorial islands are scattered over millions of square kilometers of the central Pacific Ocean, with a total land area of about 284 square miles (736 square kilometers). Kiritimati (Christmas Island) in the northern Line Islands accounts for about 48 percent of this land area. Banaba is a raised limestone island, but the other islands are all coral atolls, and most have lagoons. These atolls rise less than thirteen feet (four meters) above sea level, raising concerns over rising sea levels as a result of global warming. The thin alkaline soils are extremely infertile, and there is no fresh surface water. Mean daily temperatures vary only slightly, averaging approximately 83 degrees Fahrenheit (28 degrees Celsius). The north of the Tungaru chain is wetter, more verdant, and less prone to drought than the south. Demography. Banaba and the sixteen most westerly islands have been inhabited for over three thousand years by ancestors of the contemporary I-Kiribati. The Phoenix Islands and Line Islands were not permanently inhabited before the twentieth century. Twenty of the islands are permanently settled. The majority of the population (92 percent) lives in the Tungaru chain, with over one-third living on urban South Tarawa. The population reached 84,000 in 1998, and is growing at a rate of 1.4–1.8 percent per year. Population has been growing rapidly since the early 1900s, and overpopulation is a serious concern of the government. While family-planning methods were introduced in 1968 and are delivered free, fertility remains moderately high and large families are culturally valued. Despite government efforts to maintain and improve life on the outer islands, there has been substantial migration to the capital on South Tarawa. There are several thousand I-Kiribati in other countries, most serving as temporary workers. There is a small migrant community of I-Kiribati in Vanuatu. Most Banabans were resettled on Rabi Island in Fiji, and became Fijian citizens in 1970. However, they retain ownership of land on Banaba and rights of residence and representation in Kiribati. Linguistic Affiliation. The I-Kiribati language, sometimes referred to as Gilbertese, is a Micronesian language in the Austronesian family and is spoken in a relatively uniform manner throughout the islands. While the language shows considerable borrowing from Polynesia, it is distinct from the language of neighboring Tuvalu and the Marshall Islands. English is the official language and is taught in primary and secondary schools. Many adults on the outer islands speak little English. Symbolism. Symbols of nationalism are linked centrally to independence. The primary symbol of the republic is the flag, which depicts a frigate bird over an ocean sunrise. Seventeen rays of sunlight represent the sixteen Tungaru islands and Banaba, and three waves represent the Tungaru, Phoenix, and Line island groups. On the flag is the motto te mauri te raoi ao te tabomoa ("Good Health, Peace, and Honor"). The national anthem is Teirake kaini Kiribati ( Stand Up, I-Kiribati ). Emergence of the Nation. In 1892, the Gilbert Islands became a protectorate of Great Britain and were joined with the Ellice Islands protectorate in 1916 to form the Gilbert and Ellice Islands Colony. In that year, Banaba, Fanning Island (Tabuaeran), Washington Island (Teraina), and the Union Islands (Tokelau) became part of the colony, as did Kiritimati in 1919 and most of the Phoenix Islands in 1937. Despite a centralized colonial government, a schism developed over time between the culturally and linguistically different Gilbert and Ellice Islanders concerning jobs and other political issues. This ultimately resulted in the separation of the Ellice Islands to become Tuvalu in 1978. In contrast to Kiribati, Tuvalu opted for membership in the British Commonwealth. In July 1979, the Gilberts, Banaba, and the Phoenix and Line Islands became the independent Republic of Kiribati. Several islands in northern and central Kiribati were occupied by the Japanese in World War II, and the Battle of Tarawa in November 1943 was one of the bloodiest of that war. However, there was little ongoing impact from the Japanese occupation. National Identity. Precolonially, the people of the Tungaru islands formed small, shifting political units, and there was no unified economic or political system or cultural identity. A single national identity emerged only after World War II as a result of colonial policies intended to move the area toward political independence. Differences between the northern, central, and southern islands of Tungaru, especially in terms of social and political organization, traditions, and group characteristics, are clearly identified by I-Kiribati and underlie national politics. Traditionally, the north had a more complex social organization with a kingship and chiefly classes compared with the more egalitarian social structure of the south. Currently the north and central islands are seen as more progressive than the south, which is more politically and socially conservative. Ethnic Relations. I-Kiribati can be considered culturally and ethnically homogeneous, with a shared genetic history, cultural traditions, values, historical experience, and language. I-Kiribati distinguish themselves from neighboring island groups and see the greatest conceptual divide between themselves and I-Matang ("Westerners"). The culture and language of Banaba are basically I-Kiribati. The primary issue in Banaban independence movements has been the distribution of phosphate revenues, not cultural differences. 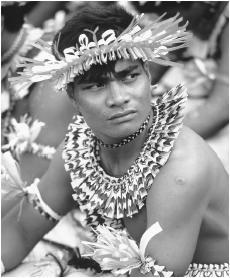 A man wearing traditional dress for a ceremony in Kiribati. and informal group activities. Maneaba built with modern materials follow the traditional prescriptions of style, aspect, and orientation. The floor is composed of unmarked but known sitting places termed boti arranged around the perimeter, with one belonging to each family represented in the maneaba ; this is the place from which a representative (usually the oldest male) of each family participates in community discussions and decision making. Churches are architecturally European and often are the largest structures in a village. Food in Daily Life. Fish and marine resources are a primary food source, as the ecological nature of atolls mean that only the most hardy plants can grow there. Local crops include coconut, giant swamp taro, breadfruit, pandanus, and a native fig. Coconut is central to the diet and is especially valued for the sweet, vitamin-rich toddy (sap) cut from the flower spathe. Toddy is used as a children's drink or as a base for syrup. It can also be soured into vinegar and fermented into an alcoholic drink. Drunkenness is a widespread problem that is dealt with on some islands by the prohibition of alcohol. Imported goods, especially rice, but also flour, canned butter, and canned fish and meat, are becoming increasingly important in the daily diet. Food Customs at Ceremonial Occasions. The display and eating of prestige foods is central to all celebrations and banquets. Although imported goods are increasingly available, local foods are more important in feasting, such as crayfish, giant clam, pig, chicken, and giant swamp taro. The most symbolically valued crop is giant swamp taro, which is grown in pits dug into the water lens under each atoll. Basic Economy. Around 80 percent of the population engages in subsistence agriculture and fishing. The cash economy is limited largely to South Tarawa, where the private sector of the economy is very small and there are few manufacturing enterprises. Independence in 1979 coincided with the end of phosphate mining on Banaba, which in 1978 had accounted for 88 percent of the nation's export earnings. The cash economy has now shifted to dependence on remittances from I-Kiribati employed in phosphate mining on Nauru or working as seamen on foreign-owned merchant ships, as well as foreign aid. Accounting for some 60 percent of the gross domestic product in 1995, aid is received mainly from Japan, Australia, New Zealand, South Korea, and the European Union. The government has determined that there is potential for the development of tourism. However, economic development is constrained by a shortage of skilled workers, weak infrastructure, and geographic remoteness. Land Tenure and Property. Access to and ownership of land underlie and cement social relations. A vital unit in I-Kiribati society, the utu includes all those people who are linked as kin and share common ownership of land plots. Everyone on an island belongs to several utu; people may inherit the land rights for each utu from either parent. The kainga , or family estate, sits at the heart of each utu, and those who live on the particular kainga of one of their utu have the greatest say in utu affairs and the largest share of produce from the land in that utu. The colonial government attempted to reorganize the land tenure system to encourage the codification of individual land holdings, in part to reduce land disputes. As a result, land transfers are now registered. Commercial Activities. Marine resources have emerged as the most important natural resource for Kiribati, particularly the licensing of foreign fishing vessels to fish in the two hundred nautical miles of the exclusive economic zone in the waters surrounding the islands. Efforts to develop a competitive local fishing company have been less successful but large stocks of tuna fish remain in Kiribati waters. Copra, fish, and farmed seaweed are major exports. Trade. The primary imports are food, manufactured goods, vehicles, fuel, and machinery. Most consumer goods are imported from Australia, and the Australian dollar is the unit of currency. Classes and Castes. Generally, postcolonial Kiribati can be considered a relatively classless society. A new social class of young leaders is emerging, however, threatening the village-based traditional authority of elders. There are also growing income disparities, and access to higher education is emerging as a key differentiating factor. Government. The boti , or clan, system, which according to oral tradition was imported from Samoa around 1400 C.E. , remained the central focus of social and political life in Tungaru until around 1870. By the time of the establishment of the British protectorate in 1892, the traditional boti system had largely been eradicated, replaced judicially and administratively by a central government station on each island. Another major change came when the colonial administration completely reorganized the land tenure system before the 1930s, taking households that had been dispersed as hamlets in the bush and lining them up in villages along a central thoroughfare. At that time, control over village and family activities started to move to the heads of families. In 1963, the British colonial government abolished the kingship ( uea ) system that was part of the traditional political structure of the northern islands. The council of elders ( unimane ) that historically included all the male senior family heads is now responsible for overseeing village and island affairs. Local government consists of statutory island councils with elected members and limited administrative and financial powers and government-appointed administrators. The government consists of a Maneaba ni Maungatabu , or parliament, which is unicameral. The Beretitenti , or president, is elected by popular vote every four years and is both head of government and chief of state. There is no tradition of formal political parties, although there are loosely structured political parties. There is universal suffrage at age 18. Leadership and Political Officials. The council of elders in each community continues to be an effective local political force. The village household is the most important unit, and within it the most important person is the oldest male. Social Problems and Control. The judicial branch of the government includes a court of appeals and a high court, as well as a magistrate's court on each inhabited island. The jurisdiction of the magistrates' courts is unlimited in land matters but limited in criminal and civil cases. There are small police forces on all the islands. Emerging substantial problems include embezzlement (often connected with the practice of bubuti , or requests by kin that cannot be refused), robbery, sexual coercion, and child and domestic abuse, often linked to alcohol use. Military Activity. There is no standing army. Kiribati has shown some assertiveness in its foreign relations, for example, in the 1986 fishing rights treaty that was negotiated with the Soviet Union despite strong opposition from the United States. Nongovernmental organizations (NGO) include the Catholic and Protestant women's organizations and the Scouting Association and Guiding Association. An NGO of traditional healers was recently formed. Australian, British, Japanese, and American volunteer organizations are active in Kiribati. Division of Labor by Gender. Labor is divided by gender, with men fishing and collecting toddy and doing heavy construction tasks, while women handle child care and cook and keep house; both genders cultivate crops. While women may fish and often collect shellfish in the lagoon, only men may collect toddy. There is a clear status ranking in each household, which is usually headed by the oldest male unless he is too elderly to be active. The control of domestic activities lies with a senior married woman. A new home in transit on the back of a truck in Tarawa. Rural houses are built with traditional materials while imported materials are used for homes in towns. law against gender discrimination. Few women have served in key governmental or political positions. Women have started to play a more prominent role through women's associations and they now occasionally speak in the maneaba . Marriage. Although historically polygamy was practiced, the marriage system is now monogamous. Arranged marriages remain common, especially in rural areas. "Love matches" and elopements have become more common and are tolerated by most families. Virginity tests of the bride remain valued despite criticism by churches. Marriage is almost universal, and divorce is unpopular and uncommon. Domestic Unit. The household is commonly based on a single nuclear family and may include aging parents and adoptive kin. 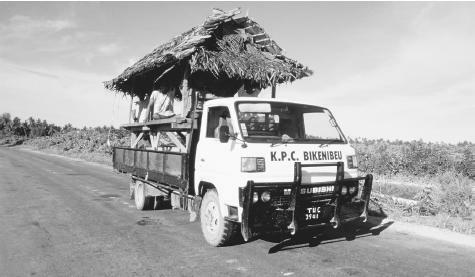 Patrilocal residence remains common in rural areas, with married women moving to live on the husband's kainga . Kin Groups. The main kinship units are mwenga ("household"), utu ("related family"), and kainga. Membership in mwenga is determined by residence, in utu by kin relations, and in kainga by common property holding and descent from a common ancestor. Inheritance of property and kinship are traced through both the mother's and the father's families. Adoption is widely practiced, especially between close kin. Infant Care. In this pro-natal society, infants are showered with attention and care by both parents and by the extended family. In the first few months after a birth, the mother stays in the house with the baby, and breast-feeding on demand is standard until at least six months of age. Kiribati has one of the highest infant death rates in the world as a result of diarrheal disease and respiratory infection. Child Rearing and Education. After infancy, care by siblings, especially sisters, is very common, even by siblings as young as eight years. Children are indulged until they are about four years old, after which they become subject to strict parental and kin authority reinforced by corporal punishment. Crying and emotional outbreaks are not tolerated, and a good child is obedient, helpful, and respectful. By age eight or nine, children are expected to start helping around the house. Beach houses in Tarawa, Kiribati, consist of thatched roofs and native wood. Schooling is compulsory for children from age six. Approximately 20 percent of primary students go on to receive secondary education. Education is highly valued by parents as a means of increasing their children's wage-earning abilities. Higher Education. Higher education is expanding and increasingly valued. Kiribati participates with eleven other Pacific Island countries in funding the University of the South Pacific with its main campus in Suva, Fiji. Technical education is available in South Tarawa at the Teacher's Training College, Tarawa Technical Institute, and the Marine Training Centre. The most important aspect of etiquette for locals and guests involves behavior in the maneaba , where there are appropriate places and ways to sit and interact. In all aspects of life, humility and humbleness are admired. Direct eye contact is uncommon, and it is inappropriate to look directly at one of higher status or cut between the gaze of talking individuals. Touching of heads is considered extremely intimate, and the top of the head is a taboo area. Modest dress is important for women, and cleanliness of the body and clothing is valued. Religious Beliefs. According to I-Kiribati mythology, the giant spider Nareau was the creator, followed by spirits ( anti ), half spirits, half humans, and finally humans. The anti were the most important figures in I-Kiribati worship before Christian missionaries arrived, and they remain respected in everyday life. Conversion activity began in 1852 with the arrival of Protestant missionaries. There was a rivalry between the Catholic and Protestant missions, resulting in deep-seated animosities that remain as an undercurrent in national and island politics. Just over half of all I-Kiribati are Catholic, almost half are Protestant, and the remainder are Seventh-Day Adventist, Baha'i, and members of the Church of God and the Church of Latter-Day Saints. Life expectancy is low, and the most common causes of adult death are infectious diseases, including tuberculosis. Liver cancer is a common cause of male death, exacerbated by widespread infection with hepatitis B and heavy alcohol use. There have been several cases of AIDS. Traffic-related accidents are increasing. While a new central hospital was completed in Tarawa in 1992 and the Ministry of Health and Family Planning provides free medical care in most villages, medical supplies and services are not always available. A pluralistic system of traditional herbal and massage treatments is maintained alongside biomedical services, and many women give birth at home. Healing traditions are passed on as special knowledge within families. The most important holiday is the annual celebration of independence on 12 July, which includes sports competitions, parades, and feasts. Other national holidays include New Year's Day, Easter, Christmas, and Youth Day (4 August). Brewis, Alexandra. 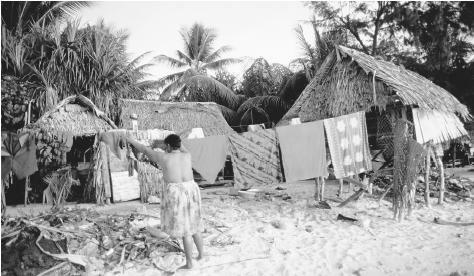 Lives on the Line: Women and Ecology on a Pacific Atoll , 1996. Grimble, Arthur Francis and H. E. Maude, eds. Tungaru Traditions: Writings on the Atoll Culture of the Gilbert Islands , 1989. Macdonald, Barrie. Cinderellas of the Empire: Toward a History of Kiribati and Tuvalu , 1982. Mason, Leonard, ed. Kiribati: A Changing Atoll Culture , 1984. Talu et al. Kiribati: Aspects of History , 1979. Van Trease, Howard, ed. Atoll Politics: The Republic of Kiribati , 1993. Kiribati is a nice place , i'm going to trip to Bairiki in March 2008 it must be snug place , i love coast tranquility, thank you for useful informations . im doing a report on Kiribati for school. im from California, In the United States. i'm doing a report on Kiritimati for school and this sight has been imensly helpful. I live in NZ and i'm soo happy to have the missing information. I wish I could have read this article before I made my trip to Kiribati last April. Kiribati is a great place for nature lovers. Yes Kiribati is one of a good place, interesting, neat and tidy, modern and so forth, especially the culture. Culture is more important to the Gilbertese as for their daily life. During the colonial period, if the colonial officer was well respected and liked by the Gilbert islanders would they fail to mention finding something of economic value to them? I ask this as part of some research that i am carrying out. Thanks for the informations on my Country Cultural History. I really like it. Kiribati is a nice country, isn't it? I know it's a small country but the people that are live there are special. Many many years ago, they don't use money to buy their foods or the things that they want, because they don't have any. But if they want something, they exchange the things that they have or their extra things with the people who don't have it with their extra thngs too. This is called the barter system. But now in these days they have money and buy whatever that they want. But any way thanks for the information on my Country, thanks and I really really like it. reading this website is awesome(: it has given me alot of inormation on my research topic. i'm am very thankful and happy for using this website :LL much appreciated! Hi I live in Ireland and my aunt was a Catholic nun in the Gilbert Islands My mother told us a lo about her when we were growing up. Mu aunts name was Sr. Olivia and she compiled an English / Gilbertese dictionary. She dealt withe Japaneese during the occupation and was awarder an OBE by the Queen. I often think about visiting the country where she spent all her adult life. I haven't seen Tarawa in ages. I wish one day I can go back and see my childhoodman. But this is actually interesting to me. Just a question regarding my project which will deal this coming Thursday, will you please to give me an information on how do we live before the Europeans came? Is the village existed during that time? I'm just grateful that I happened to come to this site by chance. It's really interesting and I like it because it is one of the sites which are very useful for students' assignments and projects. I could have surfed this site earlier! I had submitted my assignment but I could have used some information from here! Anyway, I wish to say that this site is one of the useful resources people could use for research work and projects. I will let the others know about this webpage. i believe that kiribati was a nice place, i used to travel to betio every weekend for just a trip. i also believe that kiribati was a paradise because it is peaceful and also people on kiribati was so lovely. i really miss my beautiful home homeisland kiribati and i wish to see it once again. Wow! I find this site very helpful. I am currently seeking sources to find evidence for my assignment in which i will reflect on my own cultural experiences and finally, i have find one!! I will tell my colleges about this site for it is very helpful. Thanks for the information it has been a really good help . It totally a lot of help. I have to do a project about it. It is also called Christmas Island. This site helped out a lot for the project. It's due next week. There is one more thing I am looking for. That is Freind social structure. Does anyone now anything? Thanks a lot! thanks for all the help i needed that for my homework!! I believe that Kiribati is paradise place because most people on it are very kind to foreign people, so this information is very helpful to me in order to get more understanding on what my assignment based on. I just want to ask a question concerning about my assignment which will due this coming Friday, would you please to give me more information on how marriage carryout in Kiribati before the Europeans came? Really happy to see this web. It's very interesting to me, especially it's really help me for some of information to my assignment. Thank you. May God bless you all. I'm from Kiribati and I'm happy to visit this site as it consists of very interesting and important information. It is important in the sense that student or other people can use it for assignments that is based on the Kiribati culture or use it for other purposes. As for me, I also take it for getting more information for my assignment on my seminar presenttation on UU114. So thanks for this wonderful information, and I hope that others will visit this website one day because it is a useful one. Not only that but also for those who don't have any idea for Kiribati history and cultures. God Blesss all of us in everything we do for the future. This article contributes a lot to my understanding to know more the history of my own beautiful country. Thanks a lot for posting this article for it had given me more information on my assignment. I am very greatful to have this article. Having searched for my assignment on UU114, I was lucky to visit this website as I have got everything I need for my assignment. Thank you so much and you have done a great job in preserving the very interesting history of our beautifl country kiribati. Keep up work good work. thanks again and appreciation your contribution for your creation. My beautiful country Kiribati is a lovely place especially for you foreigners, wanted to visit here. Come and enjoy yourself with your family. All of my traditional cultures are available if you want to know more and expand more your understanding about Kiribati. Te Mauri, Te Raoi, and Te Tabomoa upon you all. I am doing an assignment on Polynesia and this website has everything I need. Thank you so much! I get the Jackpot YES!!! an overwhelming gratitude to those who provide this web site because it gives me a satisfaction data which is very useful to assignment on TS107 and a presentation on a UU100. Im suprised to see lots of people logde in their comments and asked so many questions about Kiribati..Its really nice to browse through the internet and find this website. Thanks for the information, it really helpful for my assignment. i went through this page, I get some information, so please upload more information about our beautiful island kiribati. I'm doing a research regarding land space in south Tarawa as it seems to be another major issue. My concern is that do families in south Tarawa teach their young generation to live our own local life, or are we influencing them to live a foreign life. Its too sad to know that most people in south Tarawa can't stand the life in the outer islands because it hard for them. Instead of teaching them to live locally we encouraged them to see the outer islands as a discipline place for them if they do well in their education or can't find a jop. I think its better for us to teach them rather than to scare them, because we never no the future of our young ones. Giving them two choices to live, we can see now that half of the population is in South Tarawa, and this is another cause of limited land space in South Tarawa for the people prefer to collect recycled fins and bottles to maintain the way they live in south Tarawa... Remember that if there is limited space there will be a lot of problems to face in terms of agriculture and illness...if you have some information and ideas for me I will be most appreciate your help. Thanks for the information. It really helps me of knowing more about where I come from and my home's identification ..
i just want your help in answering one of my objective base on change on economic and social before Kiribati gain it independence. thank you and I'm looking forward to hear from you. As a seafarer for fifty years I had the privilege of visiting Christmas Island many times.And sharing in the warm hospitality of its people. We would land books magazines even the ships doctor onboard would hold a surgery to give treatment to those that attend.On one voyage a dentist who was travelling gave up his free time. I met the local policeman and the priest who were warm and friendly to which i spent time talking. I was lucky enough to arrive once on Christmas Day on the island and went ashore dress as a tropical father Christmas.i recall the local people sat in a circle singing their folk songs throughout the day.In my spare time I would walk to the lagoon and spend the afternoon on the beach and relaxing i have many photos of my visits and recall how the people of Kiribati made me welcome to which i was so privliege to meet and share some wonderful memories. I would like to thanx those who upload this information as it has help complete my assignment. And it also helps me understand more the culture of my home country, Thank you looking forward to hear from you. Thanks for your incredible information it really helps and evokes past times of my beautiful traditions and lifestyles. How wonderful to brows this website and hear the legend of my beloved Country. I feel so excited after reading this, for it reminds me of the past compared with nowadays. thanks for the useful info on the primary reason for banaban surge for independence. I really really know that Kiribati is the most interesting country, because of their cultures, foods and everything, so thnk you all for watching this website. By reading this article of my own country I just realize it that Kiribati is one of the most wonderful place where we can learn our culture and belief before. The website is very interesting and it's helps me a lot to collect my information regarding my assignment on speech. i really want to know more on the dressing in the Kiribati context. thank you very much! im a tourism student from philipines,im doing my report in world tourism and its about kiribati. im so glad that i got a lot of knowledge about different country. I would like to thanks those who upload this information. I think its help me to complete my assignment.. :) I was lucky to visit this website as I have got everything I need for my assignment. Thank you so much and you have done a great job in preserving the very interesting history of our beautiful country Kiribati. Our culture is very unique, it takes a million time to think how do it exist when you haven't got a clue about it. This website helps a lot to our Kiribati people near and far who need to know and understand their root as I Kiribati people. Thanks to this site, this is another way to Protect, Preserve and Promote our culture. I really like this article, it very helpful and extremely interesting to here that Kiribati is very unique in it culture. thank you so much for helping me in searching my information for my assignment. OH MY GOD!! This is really mind blowing and keep reminding me about my beautiful country which only love concern nowadays within a family. Greetings from Pennsylvania, USA. Thank you very much for providing this highly illuminating information on Kiribati. I'd love to visit and, may be, spend a considerable length of time among the friendly people. My only suggestion is the addition of more photographs of people and places, in color. Grateful thank for a wonderful work of those who exert all their effort to provide this.I'm tired of surfing a very wide web for relevant information but I finally got your useful piece of work on this website. This article really helps me to understand better the life of our people and the nature of our beautiful country. Thanks so much for this information since it enhances my understanding about my peaceful island Kiribati. Hope people will also enjoyed this and know more about Kiribati. it was an interesting article of my country Kiribati, thanks its really helpful with my search on the culture of My Kiribati Island.